The Parallel Runtime Scheduling and Execution Controller (PaRSEC) is a generic framework for architecture-aware scheduling and management of microtasks on distributed many-core heterogeneous architectures. Applications considered are expressed as a DAG of tasks with edges designating the data dependencies. DAGs are represented in a compact, problem-size independent format that can be queried to discover data dependencies in a totally distributed fashion—a drastic shift from today’s programming models, which are based on sequential flow of execution. 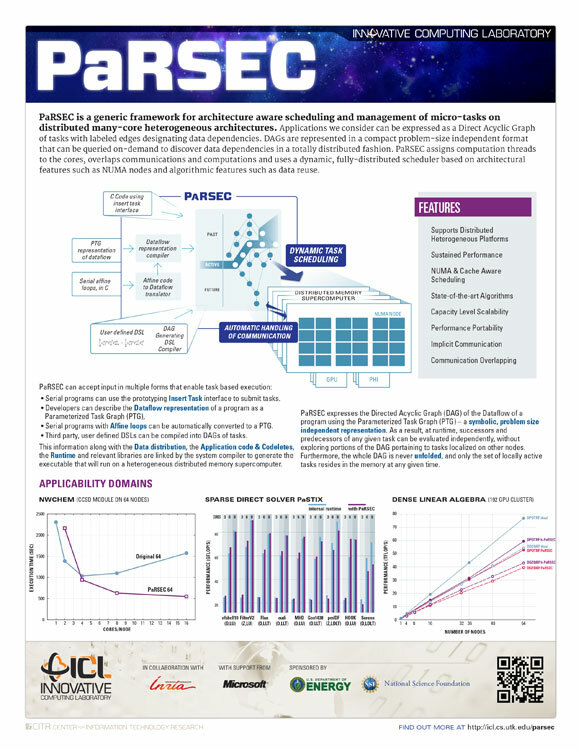 PaRSEC orchestrates the execution of an algorithm on a particular set of resources, assigns computational threads to the cores, overlaps communications and computations, and uses a dynamic, fully distributed scheduler. PaRSEC includes a set of tools to generate the DAGs and integrate them into legacy codes, a runtime library to schedule the microtasks on heterogeneous resources, and tools to evaluate and visualize the efficiency of the scheduling. Many dense and sparse linear algebra extensions have been implemented, as well as chemistry and seismology applications, which produced significant speedup in production codes.